BOMA Quebec has launched a friendly competition to motivate owners of commercial buildings in the province to reduce their energy consumption. Front row: Rémi Dubois, Director of Client Services, Hydro-Québec, Bruno Turcotte, President BOMA Québec, Linda Carbone, Director BOMA Québec, Mario Poirier, Past President BOMA Québec, Jean-François Parenteau, City of Montreal. Image courtesy BOMA Quebec. 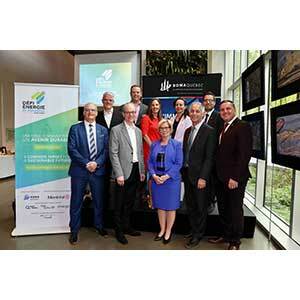 The Défi Energie en Immobilier (Building Energy Challenge) is a Quebec version of Race to Reduce, the energy reduction challenge already launched in Toronto and Manitoba. “We have a role to play in reducing the environmental impact of our activities,” says BOMA Quebec president Bruno Turcotte. Besides, he notes, buildings that have a solid energy performance and reduced environmental footprint see a corresponding increase in their value. Turcotte says he is convinced the Challenge will make a tangible contribution to reducing energy consumption and greenhouse gas emissions in Quebec’s commercial real estate sector. The Quebec version of Race to Reduce has been in the planning stages for three years, says Mario Poirier, former BOMA Quebec president and co-creator of the project. In Montreal, “sustainable development and economic vitality must go hand in hand,” adds Jean-François Parenteau, a member of the City of Montreal’s executive committee. When Civic Action Toronto launched its energy challenge program in 2011, it aimed for a reduction of 10 per cent in greenhouse gas emissions by 2014, Poirier says. Instead, it reached 12.1 per cent. (BOMA Toronto followed suit with the launch of Race2reduce in 2017). The Quebec program is adapted to its climate and takes into account the provincial government’s 2030 Energy Policy, which aims at improving energy efficiency by five per cent and reducing petroleum product consumption by 40 per cent. Building Energy Challenge’s goal is to encourage buildings to reduce their energy consumption and reduce greenhouse gas emissions by at least 10 per cent in four years. The program is intended for owners, property managers and tenants and it aims to include 100 commercial, institutional and multi-residential buildings in its first year. Residential, commercial and institutional buildings produce more than 10 per cent of greenhouse gas emissions in Quebec. According to BOMA Quebec, if 15 per cent of Quebec’s commercial and institutional buildings reduced their energy consumption by 10 per cent, it would represent a decrease of 60,000 tonnes of carbon dioxide a year, the equivalent of approximately 12,000 fewer cars on the roads. GWL Realty Advisors, Bentall Kennedy, Ivanhoé Cambridge, the Société québécoise des infrastructures and La Capitale Insurance and Financial Services are among the real estate players who have so far agreed to participate in the challenge. The launch of the initiative took place at the Maison du développement durable, a downtown Montreal building that houses a number of organizations devoted to sustainable development and uses a geothermal energy system for heating. The City of Montreal, Quebec government organization Transition énergétique Québec, Hydro-Quebec and Énergir (formerly Gaz Métropolitain) are the founding partners. Participants will enter their energy data online using the Energy Star Portfolio Manager platform. The free tool allows users to enter data and measure and monitor consumption of electricity, natural gas and water and greenhouse gas emissions. Participants will have access to tools that can help them reduce energy expenses, seminars and webinars on buildings’ energy performance, information on government grants for retrofits, energy audits and more. Aside from awards for reducing greenhouse gas emissions, energy performance awards will be given based on the evaluation of a building’s energy performance by taking weather conditions into account. Collaboration awards will also be given to landlords and tenants who have demonstrated collaborative efforts to bring together and engage stakeholders around issues pertinent to energy efficiency and sustainability. A recognition evening will be organized each year to highlight the winning participants and unveil the progress participants are making toward reaching the greenhouse gas reduction target. A gala event in 2022 will be held to announce the overall results and the impacts of the program. The program is free and participation is voluntary. It is open to all commercial, institutional, mixed-use and multi-residential buildings in Québec, whether or not they are BOMA Quebec members. Registration for the challenge is now open at buildingenergychallenge.ca.